Book Review - "Amish Prayers"
Beverly Lewis has complied a collection of "Amish Prayers" in a beautiful hardcover book. The Amish are a fascinating group of people who live simply and have such a strong faith, although it does vary from other cultures and denominations. However, their love and awe of God is evident in their prayers that are very heartfelt and full of meaning. Lewis' collection contains prayers of different types and are organized in different chapters. For example, there is a chapter of "prayers for a new day," "prayers of gratitude" and "prayers for strength" just to name a few. This book would make a great devotional or prayer guide as the reader can easily find a type of prayer that fits the need or mindset at a time. A beautiful collection to add to anyone's library! Book Review - "A Great Catch"
Lorna Seilstad's latest novel, "A Great Catch," book 2 in her Lake Manawa Summers series will put you right in the mood for summer and have you longing for time to lounge at the beach or a summer home and enjoy the beautiful weather! Emily Graham is the president of the local women suffrage club and although it is summer she is not slowing down her efforts to help women gain the right to vote. Emily is spending the summer with her grandmother and her two great-aunts whose goal seems to be to find a man for Emily. Emily is not seeking for one herself, but she crashes into Carter Stockton, a pitcher for the local baseball team. Emily soon finds herself spending a great deal of time with Carter and must learn to seek God and not push Him aside to focus on everything else in her life. This is a great second book to the series. Set in the summer of 1901 in Iowa, you will be transported to a different era and this time period comes alive on the pages of this book! The main character from book 1, Marguerite, is back! She is married to Tripp and they have a little boy. It is great to read about some of the previous novel's characters and to learn more about Emily in this book. Seilstad creates great characters and they are very realistic and are dealing with family and relationship issues, dealing with their own pride and also political issues that were prominent during this time. The historical details add a lot to the story. I enjoyed reading about the Bloomer Girls' visit to the lake and this event. I highly recommend this book to anyone enjoying historical fiction - it is a perfect summery read! Book Review - "A Killer Among Us"
A fan of Lynette Eason's first 2 books in her Women of Justice series, I was excited to read her newest book, book 3 "A Killer Among Us." Readers were introduced to Kit Kenyon, Jamie and Samantha's sister who has been raised by different parents, at the end of book 2 and now Kit returns as the main character in book 3. Kit is a hostage negotiator and finds herself in the midst of a new crime involving a serial killer targeting law students until she finds herself wanted by the killer and being held hostage herself. Kit finds herself attracted to her new partner Noah and is trying to adjust to her family she grew up not knowing she had. Eason's beloved characters return from the first two books and the readers are introduced to new ones as well. This story held my attention and I wanted to read and read until I reached the end as I had to find out all the facts. The many twists and turns will keep you guessing and keeping you turning the pages. The characters and story are so real, they could be your next door neighbors. A must read for romantic suspense fiction readers! Book Review - "A Reluctant Queen"
Joan Wolf has created a fictionalized account of Esther in her novel, "A Reluctant Queen." While Wolf adds to and shares her own take on the story of Esther, the Biblical principles and truth are evident throughout the story. Esther is a young, simple girl; however her heart grabs the attention of King Xerxes and forever history is changed and loves grows between these two individuals. Wolf has expanded upon this Biblical account and this is really a beautiful love story to read. The characters come alive on the pages and the reader will gain a deeper knowledge and understanding of a story that may not be as well known as some Biblical accounts. I highly recommend this book, especially to those who enjoy historical fiction. *I received a free copy from Thomas Nelson Publishing in exchange for a honest review. Book Review - "Beyond All Measure"
Dorothy Love's debut novel, "Beyond All Measure," is sure to be a popular read among historical fiction readers! Set in the post civil war era, Love does an excellent job at incorporating this time period into her story. Ada has no one left in her life - her parents, her aunt, her fiancee, her friends - they are all either deceased or have deserted her. Answering an ad in the newspaper for being a companion to an older lady, Ada travels from Boston to Hickory Ridge, Tennessee with what little money and belongings she has left. When Ada arrives she is met with one surprise after another, and she quickly questions her decision. Being a Yankee, Ada is met with hatred and some wariness by some people as she is merely judged based upon where she is from. Ada finds herself in the midst of tension and disagreements among the townspeople, but yet she finds herself fitting in with Lillian, the lady she is caring for, and Lillian's nephew, Wyatt, who is her employer among a few others. Ada's plan is to establish a millinery shop and carry on creating hats in memory of her mother; however she is met with mixed responses as to this as well. Ada is struggling to create a new life for herself, but she must deal with some unresolved issues from her past as well. This is a great story that will encourage readers to work through things from the past and to not be afraid to take risks and move on. The characters are all very realistic and easy to empathize and make a connection with while reading. I am eagerly waiting for more novels from this new author! Book Review - "A Heart Divided"
I have just read "A Heart Divided," book 1 on Kathleen Morgan's Heart of the Rockies series and I am eagerly waiting for book 2!!! This is the first book of Kathleen Morgan's that I have read and I am going to for sure read the other books that she has written! I was drawn right into the story in the first paragraph, becoming totally captivated and just want to keep reading until I got to the end of the last sentence. Living in the Colorado Rockies in the late 1800's, Sarah Caldwell is the loyal daughter and sister to her father and her brothers, even when she does not approve of their actions. The Caldwell family has been feuding with the Wainwrights for years, but suddenly Sarah finds herself in the midst of this as she is taken hostage by a Wainwright son, Cord, when he recognizes her as the beautiful girl who distracted him while his home was robbed. Cord Wainwright tried to escape his father's criticism and life all together, but has returned to help out physically and financially on the ranch. Cord realizes that Sarah is not to blame for her father's actions as she cannot control her father anymore than he can try to control his. Cord and Sarah try fighting the growing attraction and love between them, but it seems that love is stronger than the hate between their families. The characters are wonderful in this book! They are well-developed and you will be drawn into their lives. Morgan's style of writing is easy and enjoyable to read. I am hoping to read more about the characters in this book, not only more about Cord and Sarah, but also Nick, Noah and Danny as well. I highly recommend this book to anyone who enjoys historical romance fiction! With Mother's Day just this last week, Father's Day is quickly approaching in the month of June. Todd Cartmell's book "Project Dad: the complete do-it-yourself guide for becoming a great father" could be yours to keep or to give as a gift! Dads play a huge role in their child's life. I had the privilege of growing up in a home with my dad and mom, married and living together. Both parents played a key role in my life and still do as I live only a short distance from where I grew up. My dad had the patience and wisdom needed for raising a large family, one primarily comprised of girls (7 daughters and 2 sons) and while he would spend time doing hands-on projects with my brothers, I can remember working in the garden with him - picking up potatoes, weeding the corn, and now I get to see him interact with my children and spend time with them. I always loved going on trips with our family as well, with my dad driving our family's suburban, and we have taken trips together still, my parents and my family together. These are just a few things about my dad. For a chance to win a copy of this book please leave a comment on this post and share a memory of your dad OR a quality that you think makes a dad a great dad! I will randomly choose one on Saturday, May 21st! Book Review - "Love Food & Live Well"
Filled with a lot of useful information, Chantel Hobbs' latest book, "Love Food & Live Well," is one that you will want to read a few times and go back to frequently as a guide. This is a great resource for anyone who is trying to lose weight and keeping the weight off. Chantel herself has lost a lot of weight, so she shares from personal experience giving this book credibility. Also, the pages are filled with recipes, detailed exercises, facts and encouragement. Chantel encourages the reader to follow the 80/20 plan, meaning you can indulge with 20% of what you eat, as you will be miserable and will most likely fail if you cut out all food that you enjoy eating. Chantel strives to get the reader to realize that food is not to be viewed as a friend or comfort, and God is here to turn to for encouragement. Also, food should not cause anxiety either and you can love food and enjoy eating, and also lose weight and be happy with how you feel and look! Chantel is passionate about what she writes and her own struggles and triumphs are an encouragement to read. This book is a valuable resource to refer back to and use as an encouragement and a guide. It is as if Chantel is right there across the table encouraging good choices, an active life and a healthier, happier life overall! 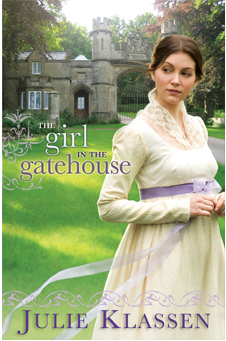 Book Review - "The Girl in the Gatehouse"
Influenced by Jane Austen's life and work, Julie Klassen brings to readers her newest novel, "The Girl in the Gatehouse." Mariah Aubrey is banished from her family and home to a relative's gatehouse. While here Mariah writes and publishes novels under the name of "Lady A" for fear of further embarrassing and angering her father. Keeping her past a secret and also her writing, Mariah is guarded with those around her, yet the secrets begin to be revealed through various encounters on the estate's premises. Captain Matthew Bryant is trying to win the approval of a lady's father and this lady's heart, but throughout the process, Bryant realizes he is losing his heart to Mariah, the woman living in the gatehouse on the estate he is renting. Set in the early 1800's the descriptions are so vivid the reader is transported back to this time and society. Klassen's book is filled with lovable characters such as Mariah and Matthew. However, Dixon and Martin are characters that add so much to the story as do the characters living in the poorhouse and Hart as well. I thought the characters are all well-developed and enjoyable to read about. I also think the quote that is included in the heading of each chapter is a nice touch. I recommend this book to historical fiction readers as it is filled with intrigue, scandal and romance. Book Review - "Larkspur Cove"
Lisa Wingate's latest novel, "Larkspur Cove," is a story of moving on, forgiveness and hope. Andrea, trying to move on with her life after a divorce from her supposedly upstanding husband, moves into her parents' beach house with her adolescent son as she has no where else to go. Beginning a new job and a new life takes a lot of strength and determination as her life is not at all what is was before. Mart is also beginning a new life in Moses Lake as a game warden and he is trying to move on with his life, yet he harbors guilt over things that have happened in the past. Mart and Andrea find themselves working together to help a little girl and her grandfather; however they begin discovering that they enjoy being with each other and their conversations no longer merely focus on their work. For various reasons they are not ready to take this step, but things become dangerous and they must really listen to their heads and their hearts. I really enjoyed this book, and I think this is partly due to being able to relate with Andrea as my job is so similar to hers. Andrea as well as the other characters are so real in the story and could truly be the members of a community near to me. Each of the characters are dealing with things in their lives - Andrea and Mart moving on with their lives, Dustin adjusting to having divorced parents and trying to fit with the new peers in his life. Birdie and Len will tug at your heart and make you wish you could just help them. This is a well-written story that is filled with some suspense and romance; it is just an overall good read! Mother's Day Contest!!! And Book Review - "Set Free to Live Free"
Saundra Dalton-Smith, MD, author of "Set Free to Live Free" is hosting a contest for Mother's Day! This ends tomorrow, Friday May 6th at 11am, so enter NOW! You can enter to win a $100 Visa Gift Card, an autographed copy of her book, and a bouquet of flowers to be delivered for Mother's Day to yourself, your mom or a special lady in your life! All you have to do is go to the Set Free Facebook page and Once you are on the FaceBook “Set Free” page, make sure you have clicked “Like” to become a Fan. Then look in the far left column and click on “Promos”. This will take you to the contest details. Simply follow the directions from there and you will be entered. Good luck to you all! Saundra Dalton-Smith, MD has written a book focusing on lies that women tell themselves, "Set Free to Live Free." Often women tell themselves lies that interfere will living a happy and fulfilling life as these lies cloud their thoughts and will hold her back from following her dreams or taking a step toward something new. It is almost second nature for many women to compare herself with others around them, comparing looks, careers and wishing that she were "perfect" as others may be viewed. Or she may struggle with trying to balance everything in her life and instead of trying something new, she may not even attempt this role as she believes it cannot be done or balanced with everything else. These are just 2 of the "lies" that are addressed in this book. Dalton-Smith's style of writing is very clear and concise and the book is filled with personal accounts and also scripture references. I enjoyed this book as it is very easy to read and follow as the layout is very simple and straightforward. I felt like the author was speaking directly to me at times and we were having a conversation over cups of coffee. I would recommend this book to all women as it is filled with great lessons and tidbits of wisdom. It is an encouraging book to read!